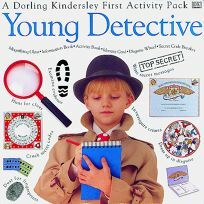 Youngsters can examine the whole kit and caboodle with a trio of First Activity Packs from Dorling Kindersley, each of which contains two detail-packed paperbacks (12 to 18 pages) and pertinent paraphernalia. In addition to the books, World Explorer includes an Animal World jigsaw puzzle, three postcards and stickers that can be affixed to a Treasure Island wall map; Nature Explorer offers a magnifying bug viewer, pop-up binoculars, more stickers and a bird mobile to punch out and assemble; Young Detective (sparse accompaniments, nifty books) features two revolving wheels--mix-and-match disguises and a secret code breaker--plus a magnifying glass and an ID card and ``diploma'' from the Secret Investigations Detective Agency. Stylish if somewhat over-packaged ($14.95 each, ages 5-up ISBN 1-56458-898-X; -950-1; -899-8 June).